When you add sprinklers to your lawn and garden, it’s a big undertaking. Your contractor will need access to your property and your house to set up your sprinkler. Installing a lawn sprinkler has many moving parts with a lot of tools, shovels and a mechanical tool to create trenches for piping. It takes about one day—unless the contractor runs into any problems or there are municipality regulations to extend the project—to install an irrigation system. Generally speaking, your contractor goes through six stages to set up a sprinkler system. He or she will refer to your property’s plot design often during the process to make sure the installation is done correctly. 1. Organizing the installation materials: You may notice your contractor laying out various materials and tools including PVC or poly piping, shovels, a backflow preventer, fittings, metal or pipe for above ground connections and many other tools in the installation process. Putting in a lawn sprinkler is a messy business. Your contractor will dig trenches and may need to disturb some landscaping depending on how the plot design is laid out. Before your contractor begins, he or she will call 811 to find out where all utility lines are on your property. Plus, he’ll contact your local water works to find out about any backflow preventer rules as well as any other regulation regarding an irrigation system installation. 2. Measuring and flagging the job site: Someone from your utility company should come to your home to mark where public utility systems are located on your property. Next, your contractor will need you to show her where all wiring for exterior lights, gas lines, drainage pipes and other yard utilities are located. Your contractor will need to plot out the site using flags for sprinkler head locations and will spray paint where the sprinkler utility boxes will be placed on your property. 3. Putting in the piping, wires, sprinklers and valves: Your contractor will dig trenches 12” below grade to place the main irrigation line as well as the wires. For the lateral lines, your contractor will dig 8”-10” below grade. Putting these lines and wires below grade protects them from aerators, lawn mowers and other landscape maintenance equipment. Your contractor will either dig trenches with a variety of shovels or she’ll use a vibratory plow to create trenches. The type of soil you have as well as common digging practices in your region determine how trenches are dug. After your contractor is finished installing the lines, she’ll backfill and compact the soil to prevent it from settling over the trenches. PVC piping: PVC is more rigid, but allows for higher flow rates. Polyurethane piping: This piping is more flexible compared to PVC. It allows for curves in trenches, and it can be longer between connections. However, it has a lower flow rate compared to PVC. Learn more: How a Drip Irrigation and Bubblers Benefit Your Landscape Beds. If you live in a cold climate where temperatures can plummet to 32°F or below, your connection will be in the basement of your home. The connection will be made with piping going through the exterior wall. If you live in a warmer climate, your connection will be in your yard. 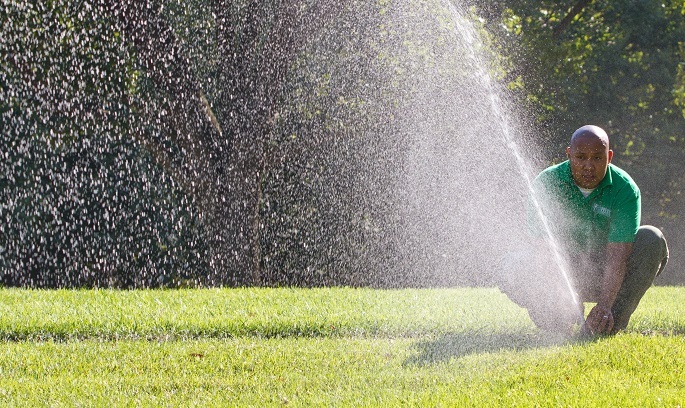 Additionally, your landscaper will install a backflow preventer which is required for anyone connecting a sprinkler with city water. Your landscape contractor may need to subcontract with a plumber or do it himself depending on where you live. RP: A reduced pressure principal. 5. Putting in the controller: Next, your contractor will install your controller in a place that’s easy to get to with access to power. For outdoor controllers, your contractor will use a conduit to protect all wiring, and the controller will be hardwired into an electrical circuit. For indoor controllers, your contractor will drill into an exterior wall to run the wire from the outside to the controller. He’ll make sure there’s a conduit to protect the wires coming in from the outside. 6. Wrapping up the job: When your contractor is finished, he’ll make a final walk through your property making final adjustments. He’ll check each zone to make sure there is no overspray and that there’s proper water coverage. After reviewing your irrigation system, your contractor will then turn off all the water and listen to the backflow preventer to make sure that there is no water flowing. If there is, it means there’s a leak, and your contractor will need to fix it for you. Watch this video if you want to learn more about what a contractor does during your water sprinkler’s installation. If you’re not a DIY’er, but you want a K-Rain Sprinkler installed on your property, you can find your local contractor on our website. If you’re a DIY’er, you can find K-Rain products at Lowe’s and The Home Depot. You can find parts at our online store. If you have any other questions about K-Rain irrigation products, call our customer service today at 800-735-7246 or fill out our contact form.